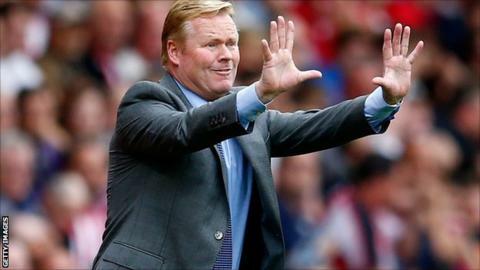 Southampton manager Ronald Koeman has dismissed calls for him to become boss of the Netherlands national team. The Dutch have made a poor start to their Euro 2016 qualifying campaign, losing two of their first three games. He was overlooked for the job in favour of Guus Hiddink, but Ronald de Boer has called for Koeman to take over. "I am the manager of Southampton, I am not the national manager and I will not be the next national manager," the 51-year-old told BBC Radio Solent. The Netherlands reached the semi-finals of the World Cup in Brazil under Louis van Gaal, now in charge at Manchester United. And former Ajax and ­Barcelona midfielder De Boer believes Hiddink was the wrong choice to replace him, with the pressure on the 67-year-old increasing following Monday's 2-0 defeat in Iceland. However, Koeman, who has guided Saints to third place in the Premier League table, said De Boer's comments were nothing new. "He said that this team needs a younger coach, a coach from a new generation. "We are not happy about the performance of Holland. After this bad start for the Europeans, it will be difficult. Of course, I would prefer if Holland would win as I'm Dutch."